Edit: Could I have some background info dumps on the Cli-tsu and/or the Flood incident that happened some time ago (so far I only seen it used referentially)? The incident gives me Warhammer universe Chaos-like vibes. Last edited by Vaerdis; 03-29-2019 at 12:59 AM. The Cli-tsu are a race that normally stay hidden and not much more should be known of them unless a person was planning on playing them as a main character. If they were an NPC or follower then they are an Exile who would be treated no differently then some random monster in the world at large. The Cylic Empire was the first Human nation, having arisen in the area that is now the Savage Lands and spreading across the North Western lands. They were able to do this because their first leader discovered powerful magical artifacts from ruins sprinkled across the land which appeared to have been created by some long dead race; the same race that appears to have originally lived in the Crimson South and was the source of the ruins there. Who this race was is not important right now as much as the Cylic Empire itself as it was from this country's heart that The Flood first appeared. Appearing as if from no where, thousands of strange creatures appeared and began to lay ruin to the Empire, causing it's citizens to flee in all directions which facilitated the wide spread existence of humans in the modern day. These monsters, later called 'Children of Sin' because it is believed that the Sins were the ones to send them and because the creatures appear to worship them, would continue to spread, relentlessly attacking any humans they could find. It was only through the courageous efforts of those that would later found their own kingdoms that humanity survived. However, eventually 'The Flood' began to recede, it's constant breaking against the defenses of humanity like waves on a shore finally falling silent. The Flood had finally retreated back to the Heart of the old Empire but those lands would forever be overrun by these monsters. Many speculated over what had caused the Flood but it was only when the Kingdom of Hommanden lowered the magical shields that it had used to protect itself from the Flood that the truth was discovered. You see, the Cylic Empire had exiled the wizards of Hommanden because they had refused, even argued against, a practice the Empire had begun to toy with; the transformation of non-human races into creatures that would serve the Empire. This was corroborated when explorers were able to discover a facility within the Savage Lands where such experiments might have occurred. Creatures like Goblins and Hobgoblins were once primitive races which the Empires experiments had transformed into savage monsters. Although there are still those that don't believe all of this, claiming plots by spiteful wizards to tarnish the great name of the old Empire, the fact still remains that the Children of Sin continue to prowl the Savage Wastes, growing in numbers as if they were awaiting something. Active Games (Playing): Ramknal as Carn, God's of Copper as Bella/Nerralla, The Founding as Richard, Isekai as a Dragon, Hive of the Overmind as Red's Party. Last edited by taleteller50; 03-29-2019 at 10:44 AM. Notes: Might change some of the descriptions and pictures pending finalization of class decisions. Also might look into smuggling but will start with tavern owner and revenge seeker. The Grudge Bearers are an organization built by Grathfire Firebeard who wanted revenge for his burned brewery. They offer a promise of revenge for wrongs for all that join. Grudges never to be forgotten even should the original holder die. The book is written in the blood of wronged and only the leader has the authority to add new grudges or strike out grudges that have been avenged. While the original hatred was for Lizardmen, the list of grudges has expanded to include many races and organizations. 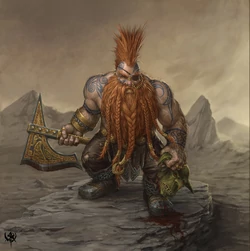 Grathfire Firebeard's ancestors were members of a Dwarven clan of Corrallu. Grathfire's father, Belegar, set up the family trade in near the northern mountains of this country. He built a stout brewhouse near the village of [Besalu], where the crystal clear waters of the River Sol cascade down from the foothills of these Mountains. After his father's death, Grathfire took over the business. Although the brewing operation had previously been moderately successful, only then did the business come into its own, thanks to Grathfire's superior brewing skills. His beer acquired a considerable reputation for fine quality and potency. Shipments of Firebeard's "Old Fortitude" and "Blood or Honey" were sent to the nobles of Corrallu, while the merchants enjoyed ales such as "Firebeard's Forge Fire" and "King's Gold". He also became known for the notorious "Golden Preserve". At the height of his success, carts of Firebeard's beer were travelling the roads of the World, while barges plied the River Sol, which connected to the great cities and trade routes of Corrallu. Within a few years, Firebeard became a prosperous brewing merchant and a reasonably content Dwarf. His brewery had grown into a small Dwarf settlement, where other families from the mountains came to live. This small community lay well off the beaten track and was usually ignored by any armies or raiders rampaging through the region. The area was protected by stone watchtowers, each with a great warning beacon that could be lit in the event of an attack. The settlement itself was surrounded by an earthen fortification with large wooden stakes driven into it. The shrewd and cunning Lizardman Bandit known as Gor-Rok, leader of the Saurus Bandits, was plotting the destruction of the brewery. He planned to destroy the brewhouse and steal all its contents. With his newly acquired beer, he believed that he would be able to bribe other lizardmen into joining him a tribe that would rival a nation. Grathfire himself was downriver, delivering a shipment of Firebeard's Special Brew to [Salamanca]. Gor-Rok sent his ally, a Lizardman pirate Kap'n Skabend of the River Ratz, to sink Firebeard's barge on his return home. The Lizardmen attacked the barge, but were not able to sink it or kill Grathfire. Following this, Gor-Rok believed that he was ready to attack the brewery itself. Mustering as many Lizardmen as he could from the [Bandit Groups], he marched towards the settlement. The dwarvers, knowing they were outnumbered, retreated behind the earthen defences of the brewery. They were aware that Firebeard should be arriving soon, and hoped to hold out long enough for his men to break the siege. However, the defenders were not successful. As Grathfire Firebeard returned home, he saw the smoke gently rising from his brewery among the trees and thought it was time that the great chimney was swept. When his barge rounded the bend of the river, he saw the smouldering ruins of his settlement. It appeared as if the victorious Lizardmen had not been able to restrain themselves, for empty beer casks were strewn about the ruins. The vats were smashed, empty barrels floated on the river and there was no sign of any inhabitants. Every last one of them had been taken off by the Lizardmen to who knew what fate. After salvaging what gear and ale they could from the ruins of the once-proud brewery, Firebeard and his remaining companions swore vengeance on the Lizardmen for this foul deed and resolved to hunt them down and rescue their kinfolk if they could. During this salvage and wake, he found a companion, Felix Jaeger. Felix shared his story and Firebeard began writing all the names of the Lizardmen that had wronged both himself and Felix, never to be forgotten.The band trailed the Lizardmen across the sea and into jungle beyond. When the paths of the Lizardmen diverged, the dwarvers resolved to follow them all. "We just chase down one group, kill 'em, then move on to the next," Firebeard was heard to mutter. After some time the tattered and blood-stained dwarves needed help, they needed an army before a great battle with the Lizardmen. They set off to the sea in search of some respite and an army. The dwarves bounced from coastal city to coastal city restocking, trading, and hunting for sellswords. While in Malabin's Retreat, they met a merchant who spoke of pirates and a haven for them. In the hunt for this cove, they were accosted by pirates and in 'exchange' for some ale, blackpowder, and coin they were lead to the Maw. While this would be a place to recruit warriors, the band of dwarves quickly realized the need for coin to pay them and for new equipment. So Firebeard turned back to his profession and passion, brewing. He sold his ship and some stored ale to gather the gold to start up his brewing operation once again. He pulls potential recruits from his brewery by running a small fighting pit for fighters to win fame and coin. In reality, Firebeard has ceased to pursue only those Lizardmen who razed his brewery. His vengeance is now set to correct any wrongs of those that join him. Felix is a human with a swordman's physique and long blond hair, who favours a simple shirt and red cloak. In contrast to Grathfire's taciturn and absolutist mentality, Felix is a much more romantic, pragmatic figure, and frequently serves as the voice of logic and moral reason of the duo in order to remind Grathfire of the long-term consequences of his actions and guide him towards greater heroism. He also finds himself serving in a more diplomatic role, helping to soothe bruised egos after Grathfire's anti-authoritarian nature provokes allies or civilized society. Felix Huss is a man not at first glance the hero many believed him to be, for he was once a son of a wealthy merchant family, and a scholar at a University. His whole life, Felix had dreamed of the many great adventures he had read about in books and stories of his childhood, and so decided on becoming a successful wizard in the University, hoping to achieve such heights. However the grim realities of life shattered that dream forever the day Felix accidentally killed a student in a sprawling match during his years as a student. Having been kicked out of the University, Felix soon became an instigator of a riot. The riot weakened and split the city enough for a passing Lizardmen group to try and raid the city. Grathfire and his band of dwarves were chasing these Lizardmen and Grathfire himself saved young Felix. After the incident, the two came into a tavern and there, young Felix got drunk on booze and misery, alongside his new companion. After Grathfire saved Felix from being killed, the two talked, and as they spoke Felix became more and more interested in Grathfires's tales of glory and revenge, and thought of an idea to make a good book and even a possibility of being able to return to the University. Felix, in a drunken stupor, swore a blood-oath to Grathfire and was compelled to travel with Grathfire after this blood-oath was sworn. A major problem for Felix lies between his desire to settle down in peace and comfort, away from the danger of being Grathfire's companion, and his longing to escape the banalities of civilized society for a life of heroism and adventure, and it is this conflict that shaped much of his relationship with Grathfire and Felix's family. Over years of following Grathfire, Felix has become an accomplished sorcerer and magic user. Fight Club -510 41810 Need to recruit Clerics to heal fight club participants. Last edited by SSlotts; 04-11-2019 at 02:42 PM. I'm working on my backstory and am planning on using Corrallu. Could you provide the name of the mountains and river and potentially any major cities in that region? Would it also be possible to provide more information on Goblins or other 'Children of Sin' as I'm hoping to have them attack his home to provide the reason for joining the Maw. Ok still here. I will post app when I have everything done. I combined a waterfront/monastary/mansion type of building. So I will need to look at the map to determine where on the docks it will be residing. Main goal of my box teams will be fishing and fishboat building. I see the costs of teams but is there a daily rate associated with them? I think with my followers I want to have them explore the various islands for any precious metals mining opertunities. So the islands with the abandon villages are their maps for them? Maps, for all the islands, for sale? Is their a possibility of getting a mining operation going? Goblins !!! If you are allowing or want a goblin sign me up. Last edited by Kshnik; 03-29-2019 at 11:18 PM. Sslots: Currently I have little in the way of details for Corrallu. If you have suggestion for names and the like please feel free to suggest them. If possible try to use Spanish Based ones since that is what the area is predominantly based on. As for monsters in the area the 'Children of Sin' would not be the main ones in the area, Lizardmen would be. Although most of their kind stick to their Empire of Blood in the south there are times when raiding parties will travel to find additional hunting grounds in swampy areas. Most Lizardmen would be as they are in normal games but the ones who have created the Empire are slightly different. Although they still have the normal types as well these are considered the bottom of the Empire's hierarchy. It is only those who have been dumped into their Blood Pools and survived who are considered worthy of more respect. Within the pools these creatures are mutated into other forms and shapes but always with a reptilian focus. Some become like giant walking crocodiles while others (those who appear to lead the others) are like feathered serpents. If this sounds interesting I can work on it a bit more for you. @ Kshnik: I'll be creating the map after I know who needs what and where. Normal Teams cost nothing for upkeep but Followers will need feeding. No maps yet but they will become available after exploring and mining operations will be possible. You just have to look for them. Tale you just had to go and do this. If I had a computer on the farm this would be easier but phone it is and app incoming for the downtrodden. In all societies there are those that are looked down upon, the poor huddled masses that even the regular working man look upon with pity or contempt. It is from these people Flotsam's ranks are formed and it is for these people's interests the fragile organization fights. Flotsam takes what is left when the world has chewed someone up and spat them out and tries to build them back up. In their shelter known as 'The Wreckage' nestled on the beach in The Outskirts they teach classes to the poor as well as providing food, lodging, and counseling to those who have lost their way. The founder of Flotsam is a former slave by the name of Tsistekeriià:kon, or Kon as many know him. Kon had nearly given into despair during his time enslaved to a Swelan merchant so he understands the great suffering so many in his organization have had to endure. His right hand woman from the start has been Tsino:wen who, much like Kon, shortens her name to Wen for all those less familiar with the tongues of The Great Planes. The two actualy escaped from the same master together those many years ago and made their way to Krakenmaw on the same boat, Kon helping in loading the ship and Wen helping to run the rigging. The two now find their days happily filled with the many demands of their positions but stories persist of the only time the duo have had to march to battle and the massacre they left in their wake. It is these stories that have provided safety to The Wreckage, even the more vicious pirate bands do not demand the return of any who shelter within Flotsam's embrace. Age: Uncertain but at least 30. Height: 8 feet at his shoulders and just over ten feet long. Weight: Lets just say he would have to use cargo scales at a dock to find out. Traits: Natural-born leader, reactionary. Db: Mark of Slavery. Personality: The stereotype of the gentle giant was likely based on one of Kon's ancestors and that trait is alive and well in the hulking man. Wise even for his kin and surprisingly silver tongued Kon prefers to discuss his disagreements with others, fearing his own strength and his inability to moderate how much of it gets used. The few times he has felt true anger in his life it has given testament to the saying "Even demons run when a good man goes to war." Brief history: Kon only talks about the time before his freedom when he feels one of the people seeking his aid and council need it but one does not need to hear his story to know the broad strokes. Silver scars are visible through all of his hair and large patches are missing entirely where the barbed whips of his master's favorite slavemaster had ripped flesh from bone. He was born into slavery and separated from his family before his first memory even formed so he never got the chance to learn his people's ways and even now only knows the language because of others who have joined Flotsam. His life was misery and suffering before he met Wen, the clever Swif having come up with a plan that, with more than a bit of luck, found them both free and floating on a trade ship to Krakenmaw. It did not take long for Kon to realize that many in the port city were much the same as himself and Wen, people who the powerful of the world had crushed under foot so often that the simple idea of trying to better your station was nearly impossible, hope a dream they could not give themselves the liberty to have because they did not fear, but knew, it would not get better. This was when Kon and Wen decided to find Flotsam, a place for those adrift in the tumultuous sea of the world. It took the two three years of hard work to make the beached ship they now call home into The Wreckage but the moment they did they opened their doors to the meek, the hungry, the huddled masses that the rest of the Maw looked down upon, or didn't look at at all. Ten years have passed since then and the two continue to improve Flotsam, adding new classes and giving full time positions to those who can teach others skills or provide counceling for the many sufferings the world puts one through. While the organisation is gentle by nature to call them pacifists would be incorrect as the first class any who join Flotsam are put into is a course on self-defense which serves three distinct purposes: 1. It provides individuals with a lot of healthy exercise. 2. It ensures members of Flotsam can protect themselves or others should a violent situation be forced upon them. 3. It teaches self-discipline more effectively than any other activity. The decision to teach such a course did not come lightly but it did come early in the organization's life when the former captain and crew of one of their newly arrived members showed up demanding them to turn the man over to them. Kon and Wen refused the demand which enraged the captain. The elf ordered his men to attack as he thought the two would be easily crushed by his seasoned crew. Kon barreled through the tightly knotted sailors and left a trail of broken limbs in his wake while Wen road the mighty bion before leaping onto the captain and pummeling him unconscious with all the effort a man would put into swatting a fly. The two avoided killing anyone but the speed and brutality of their assault left little question in the minds of those gathered to observe, when someone was sheltered within the embrace of Flotsam they were safe. Height: four foot tall at the tip of her ear but nearly six feet if you go from ear tip to tail tip, she will proudly proclaim this to anyone who calls her short but it's always with an air of good humor. Weight: Kon has more than once not noticed she was even on him so somewhere between 0 and 200 pounds. Trait: Reactionary. Db: Mark of Slavery. Personality: Where Kon is calm and soothing Wen is as bubbly as a living being is capable of being. She took the trauma of her past and learned that the only way to defeat the horrors of the world was to smile in their face and try to fix them. Brief history: Before meeting up with Kon Wen was used for entertainment. She has never elaborated on what that means to anyone other than Kon and he refuses to tell others. Their master would force her and other Swif into complex mazes filled with traps and predators and only the first to make it out was allowed to live. Their master called this twisted game of his the rat race and Wen ran that race three dozen times before finally meeting up with Kon and coming up with a way to escape. Since their escape her story has been insepperably entwined with his other than the fact that she got a crossbow and learned to use it since she figured if something was too strong for Kon to fight it up close she had no chance. Oran W2 A taloo pirate who could not stand the brutality of the crew he found himself on Oran fled to Flotsam in it's infancy. He watched in amazement as the founders easily defeated the bloodthirsty crew and since then he has had a near fanatical devotion to the organization. He now teaches the self-defense course at Flotsam. Tsrak and Valk A1/W1 A bonded pair of kiiyaa that found themselves in Krakenmaw after a very long time spent in a drug induced haze. A group of pirates had conscripted them into unwilling service and forced powerful stimulants into them. The two got off at Krakenmaw and the crew did not even attempt to make them return. They spent the next twenty years doing all they could to get a fix and only when Kon and Wen found them half-dead in an alley did they find help for their problem. It was a hard road but the two have been sober for five years and now Valk teaches classes on substance abuse while Tsrak is the substance abuse councillor. Tin Scale E1 The tiny kobold is the most recent addition to Flotsam's staff but his enthusiasm is second only to Oran's. Tin was, much like most kobolds, pushed to the edge of society and had been panhandling before finally coming to The Wreckage in the hopes that Flotsam would not turn him away. He found a community of people who embraced him for who he was and now the kobold does community outreach trying to spread the word of what Flotsam is trying to do. John E1 The only human on Flotsam's staff John teaches mathematics and personal finance. When asked what he did before joining Flotsam he most commonly answers the devils work with a look of profound sorrow. When he first came to work for Kon and Wen he let them know he had done the ledger for a slaver before coming to Krakenmaw and didn't want that knowledge to turn others away from coming to Flotsam. Much like all secrets the two have been asked to keep the information has never escaped the room it was aired in. Klirik'thrikit'blurrug'nivrixlatik "Tik" E1 Tik represents perhaps the greatest oddity in all of Flotsam as he is, rather obviously, a sauhaugin wearing a trench coat and a large hat. Tik came to Flotsam seeking asylum from his homeland and has never given, or been asked, the reason why that was necessary. The sauhaugin is affable once you get past his general appearance and teaches the two most popular classes Flotsam offers, fishing and aquaponics. Floer A1 The happy go lucky fuusa is the only member of Flotsam's staff who joined not out of desperation or in an attempt to seek redemption. Floer heard of what the organization was doing from a passing merchant and got on the first boat she could find heading to Krakenmaw. She now teaches first aid and is the group's resident nurse. Anubis E1 The former puumar slave arrived at The Wreckage covered in blood, precious little of it his own. A puumar ship crewed by almost entirely slave labor had been picking up some piece of art or another for his former master when he and his fellow ruuha revolted. Anubis was one of three survivors but he told Kon and Wen that he would rather die a swift death as a free man than a slow one as a slave. Anubis teaches woodworking and net weaving classes, the simple tasks proving the best therapy for his trauma. Yeran E1 The rather thin Bion was born and raised in Krakenmaw, living life as a day laborer and finding peace at the bottom of a bottle. He hit rock bottom when he started doing pit fights just to get enough money to drink. He came to The Wreckage the next day. Since being a part of Flotsam Yeran has shown great skill at organization and keeps the day to day operations flowing smoothly. Nidi E1 The puumar was working as a professional dancer when she came to Flotsam. She had enjoyed the work well enough but when she attempted to leave to a different location her boss was less than please and beat her mercilessly. While healing up she snuck out and came to Flotsam as quick as her feet would carry her. She now teaches various language courses for Flotsam as well as dance classes twice a week. Wilsy E1 The sun dwarven architect has helped Kon and Wen since they opened their doors with only a classroom, a common bunk, and a dream. Now that they have expanded well beyond the original ship Wilsy has been hired on full time to help with expansion and teaches a class on structures and architecture every day after dinner. Flotsam operates almost entirely on donations. It's a strange thing to say that in a cove full of pirates but it's true. They make a bit of coin by selling some of the goods they make or obtain in classes but that tends to go into buying more supplies and paying the teachers. Facility upgrades and long term investment are community driven, mostly by folks who have gone through the doors of The Wreckage and made a better life for themselves or by Kon and Wen themselves when they find a way to make some extra coin. Kon is currently attempting to find someone who would be willing to teach the skills necessary to build a ship at Flotsam but has had little luck, a shipwrights skills in much too high demand for the pay Flotsam can offer. When not doing something involving Flotsam he can be found working the docks as a loader and unloader of cargo to donate more. Wen has begun making money on the side as a messenger for some of the wealthier people in town, her small size and incredible speed making her ideal for the job. The converted ship has expanded well beyond its original bounds and now stands as a monument to Flotsam's purpose. Total cost: 7,990 out of Kon's wallet leaving him with 25,010 gp. Remainder: 3,295 all spent on a cauldron of plenty dropping it's price to 11,655 coming from Wen leaving her with 4,295 gp. Horton Dumound: One of the first through the renovated doors of The Wreckage the young merchant came to Flotsam with nothing. He had lost everything on a risky investment and when it all went south he lived in The Wreckage for three years while he found ways to make money and smarter investments to place that money in. Seven years later and he has three ships under his command and is seen as a rising star in the merchant community of Krakenmaw. The formerly brash and impetuous youth was tempered by his failure and now he is a calmly calculating merchant who will only put money down if he knows the outcome, and he knows Kon and Wen are a good investment. Reigel Redshell: The kiiyaa map maker spent the first eighty years of his life not knowing he was good at anything. He tried working as a cargo loader but he moved too slow and had a tendency to trip when carrying heavy loads. He tried being a sailor but he couldn't stand to be on deck in a storm. He even tried being a mercenary for a while but he found he didn't like hurting people. He came to Flotsam because, well, he didn't know what else to do with his life. After talking with the young kiiyaa Kon and Wen quickly realized he had a good hand for drawing and a perfect memory for anywhere he had been. The two encouraged him to pursue mapmaking and now Reigel makes all of his money copying old maps and hiring onto ships as a navigator and map maker when their ventures push them beyond the known edges of the world. Tuktuk Reaver: Tuktuk is Tin scales best friend but where Tin joined Flotsam Tuktuk hopped on the next pirate boat and now the little kobold is making a name for himself with his strange ability to survive even the worst of deck battles. At this point his captain regularly sends him onto enemy boats alone just to see if anything can kill the mad little kobold. So far he is missing a toe and half a horn but he isn't complaining. Milsy: Twin brother and greatest rival to Wilsy the two have been challenging one another to better themselves and home their skills since they were toddlers but at the end of the day they get alo my well and their constant arguing back and forth is well meaning. Milsy has managed to get in the good graces of the Cullin and is now building homes in the richest areas of Krakenmaw. Ruby "The Scarred Angel": A beautiful human woman who was working in the world's oldest profession before coming to Flotsam. A particularly twisted john left her face badly scarred and she came to Kon on the street where he carefully and swiftly ushered her home. The john received a note in his sleep informing him if he wished to see another sunrise he would need to leave Krakenmaw and never return. Ruby has become bitter since the assault but she is fiercely loyal to those few who have earned her friendship, and simply fierce to all others. In recent years she has taken up with a pirate crew and whispers of "The Scarred Angel" are spreading quickly. Blurqulik'rbble'tigglerk'ribler: There are few universal constants that are shared among the races but the rage of a father toward a charismatic young ragamuffin seducing and deflowering his previous daughter translates to every language. Blurqulik found Tik swimming out of his daughters room and the sauhaugin soldier chased Tik till the young sauhaugin made landfall and vowed if he ever found the young Casanova he would kill him. The ledger must be balanced. Dorian Coralbow: the sadistic captain of The Last Gasp and former captain to Oran. After his humiliating defeat at the hands of the founders of Flotsam Dorian has only dove deeper into his cruelty. His crew is known for slaughtering children and elders when raiding shores. Smart, violent, and utterly psychopathic Dorian has every intent of coming back to The Wreckage and rectifying his shameful defeat. Ra'Tek: The captain that took Kon and Wen across the seas to their new home. The ruuhaa isn't shy with his opinion and has a habit of angering people of influence. A champion of abolitionism Ra'Tek rides the line between pirate and freedom fighter with the Pumaar Empire the focus of most of his ire. Brave and stubborn to a fault there are few better people to have on your side. Sin'Ha: Anubis's former owner is, at her core, an absentminded art collector. The manager of her home however is a brutal slave driver who uses his position as the ranking slave in the home to rule over "his" domain with an iron fist. Ottiluke: Captain of The Resilient and long time friend of Floer. He runs a tight ship of bounty hunters known for both their morally absolute view and their skill at bringing bounties in alive. Bass Reeves: Resident marshall of The Outskirts Bass is a firm believer in law and order in a city with precious little of either Reeves hunts bounties and operates as a hard edged vigilante keeping The Outskirts safe. The Marshall will always act in what he views as the communities best interest however his world view doesn't allow shades of grey and it is very hard for him to accept people can change. While Bass has a great deal of mutual respect with Kon and When they do have one major point of contention, John. Bass has held into a bounty poster of the man since he came to Krakenmaw but has not, yet, asked for Flotsam to turn over their accountant. Vhodak "Ironshell": A Kiiyaa legend and a generally inspiring captain. His ship, The Bowbreaker, is likely the most heavily armored ship to sail the seas with its iron coated top and that's before you include it's all Kiiyaa crew. Brother of Tsrak the privateer hadn't known if her and her husband's decades long struggle until a year ago and When he learned of it The Bowbreaker showed it's name to be true when he hunted down the pirate and left his ship as kindling. My goals in this game are a bit simpler than most folks probably will be, I just wanna see how these characters develop in a town that is diametrically opposed to themselves while they try to make it better. Work has returned to normal as has posting. Last edited by MundayKnight; 04-11-2019 at 10:45 PM. Just like to update what I have gotten done with the Black Jackals so far. I've bought them a ship, finished Prak and Druse's sheets, and made a handy dandy chart about my purchases. Now time to equip followers, and see if we can afford any cool magic items! Big update on my post on Page 4. A question or two for you,Taleteller50. This game has created lots of fun just trying to come up with the application for which thanks. This game has created lots of fun just trying to come up with the application for which thanks. I second that- even if I don't get accepted this will be well worth the time! Net is fixed, im back. Well my cohort is one of those CNs who is toeing the line between neutral and evil, so we'll see how it goes if I get in! I look forward to seeing what trouble I can get into as evil pirates. It is quite exciting seeing what a vast army of hirelings can or will do. Nearing completion, have all but about 7k gold squared away. Just remember that you won't have direct control over your followers unless one of them is the primary character you plan on acting with in lue of the Faction Leader. Followers are to be gathered into Teams for downtime (rounding up in the case you have only 3 or 4 lv. 1's left for what usually needs a 5 person team) and used in connection to your Leader and Cohort's actions. The Lv 4 and up Followers will of course play bigger rolls as Managers but even they will only be put in charge of businesses for the course of the week to produce Gold or Capital for your faction. This will be a little different in mass combat like ship to ship combat where these 'mid' level characters might play a slightly larger role but as they are all restricted to NPC classes like Adept and Warrior that will also be more on the minor side. I do however appreciate everyone's vote of confidence in all of this and I hope I can live up to your expectations. Don't forget about NPC Contacts which, although not required, have the potential of making your faction more influential in direct collation to how much you are willing to create/write.